Water, juice and snacks will be given to volunteers as well as the cleaning materials (bags and gloves). We ask the volunteers to bring their water reusable bottle and hat with them. There will be symbolic tree planting after cleaning is complete! World Cleanup Day is a global social action program aimed at combating the global solid waste problem, including the problem of marine debris. It is typically held over the course of a 24-hour period in September, on an annual basis.There are numerous organizations that facilitate and host World Cleanup Day events globally. Like Earth Day, World Cleanup Day is non-partisan, apolitical, and is not affiliated with any national or global political party or discrete ideology. 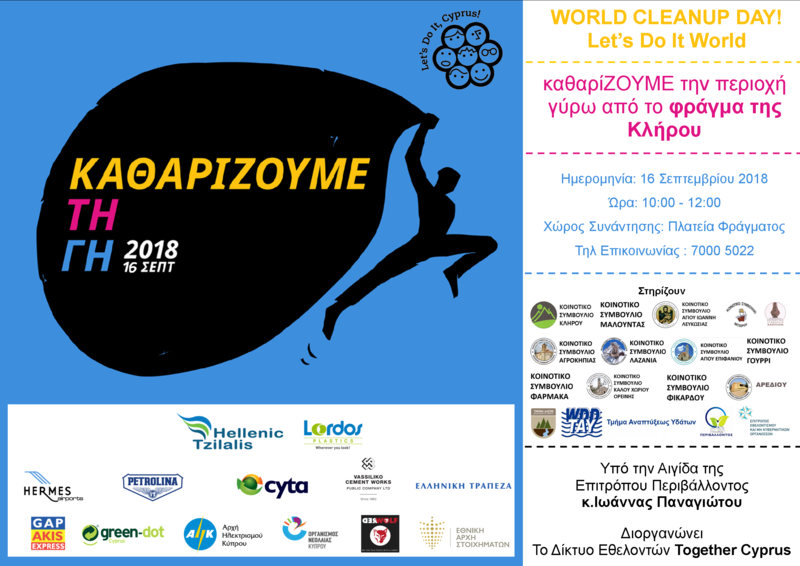 The next global World Cleanup Day is September 15, 2018, beginning at 10 a.m., and spanning the world’s time zones until concluding near the international date line in Hawaii. World Cleanup Day is a decentralized network, made of different grassroots efforts. One of the largest organizers of global cleanup efforts is Let’s Do It! World. Founded in Estonia, the organization successfully mobilized more than 50,000 volunteers for a single-day, country-wide cleanup effort that resulted in the elimination of 10,000 tons of illegal waste. The Estonian action, called Let’s Do It 2008 emerged as a global model, spreading globally thereafter. Today, the movement has grown into a network of 150 countries. All together, more than 14.5 million participants have been engaged in movement’s activities.